It’s not easy running a class party–for any holiday–but with the right help and planning, any Room Parent (and his or her small army) can pull one off with ease! 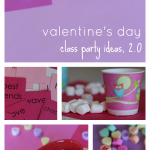 Valentine’s Day class parties are no exception. There’s no magic formula, but I’m a firm believer that this parenting gig is hard enough–and there’s no need to reinvent the wheel. Especially for our fearless, brave, admirable Room Parents. This isn’t rocket science, but I do know it’s easier for some folks than others to find the right mix of games, crafts, and snacks to introduce to elementary schoolers. I know it’s easier for some to delegate duties to parent volunteers, organize and plan, and stand in front of a group of kids and get them from Point A to Point B with smiles on their faces. But all Room Parents deserve a hearty (gentle) pat on their backs for taking on the j-o-b. It’s not easy. And we’re all busy. 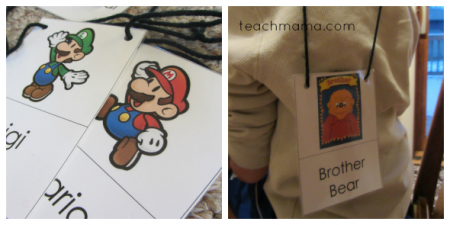 I’ve only been a Room Parent a few times, and I certainly wasn’t perfect, but these are some things I did–with the help of my co-parents and our small army of volunteers!–and I think the Valentine Day parties all went pretty well. 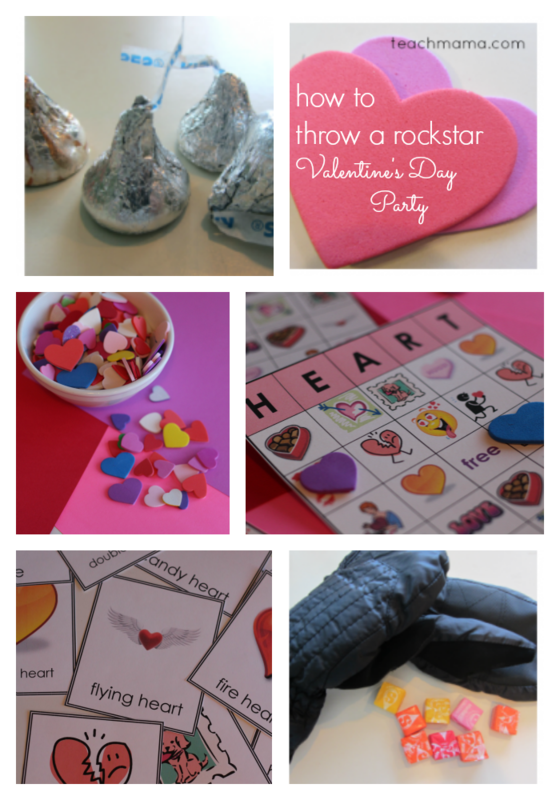 How to Throw a Rockstar Valentine’s Day Class Party: In most schools, there’s not a whole lot of time for the actual party. My class party ‘plan’– nothing fancy and a work in progress, but it helped! And in most schools, the ‘big’ crazy fun event is delivering those love-filled Valentine cards. So I think the delivery should be the main activity–though there needs to be a few other games and activities thrown in the mix for sure. 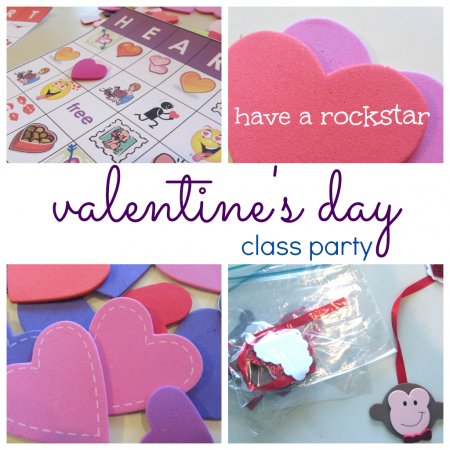 Set-up/ Prep: Sent out this Valentine’s Day Class Party Note (grab it below!) about three weeks before the party. And then really use your parent volunteers! 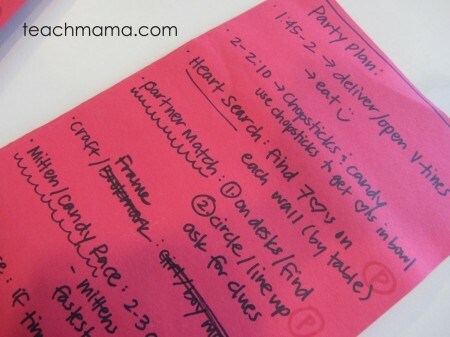 Make a quick and easy ‘Party Plan’ for all of the volunteers to have on hand during party day. Prepare Goodie Bags: Just a few dollar-spot items–pencils, stickers, temporary tattoos, nothing fancy. But the goodie bag is a great landing spot for the crafts and sweets from the party, too. And my feeling is that if there are goodie bags at the end of the party, there’s no need for prizes in between. Decorations: I’m not big into decorations, because I’m much too boring. I think you’re good with streamers, dollar store tablecloths, and pink napkins. But other than that, unless you can keep them every year–to use for the next party–I think they’re a waste. Only because the kids don’t care–they’d rather have more games, more goodies in their bag, more goodies during the party. Move the desks into four clusters, and put a tablecloth over each set of desks. That way, when kids are finished eating, it’s quick clean-up! Divide the class into 3-4 smaller groups. That way, they can rotate between fun stations without a hitch. 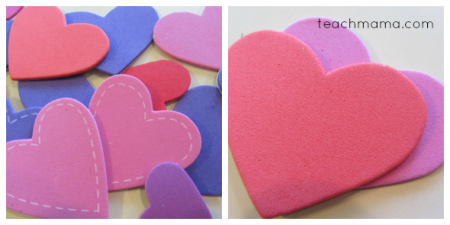 Divide them by having them pick heart foamies (or stickers, or numbers, or whatever) out of a hat. They can slap that sticker on their shirt, and there’s no question about what group each kid is in. Start the party by arranging groups, and have each group give a big cheer: Let’s hear the pink heart group give a happy shout! C’mon, purple hearts, let us hear you!. . .
Let them eat sweets and deliver valentines. Priority numero uno. But do it in shifts! Have the parents put the snacks out on plates while other parents are decorating. Do not let it be a kids’ choice free-for-all, and really go easy here! Store-bought Valentine cupcakes, a cookie, juicebox, and fruit. Bam. Done. Say, Okay, first graders, while everyone’s eating, let’s have the Purple Heart group grab their Valentines and deliver them to their classmates. Deliver them with a smile, and when you receive one, I think Mr. [teacher’s name] would love to hear his students practice good manners! I’m sure we’ll be hearing lots of ‘thank you’s!’ from this great group of smart first graders! Once the sweets are eaten, trash cleaned up, and Valentines delivered, time to get your game on! 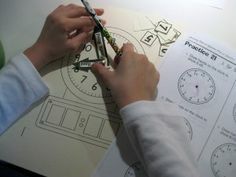 Next, divide them into their groups, and put the parents to work! Group 1: Craft — The crafts for these parties have to be SO EASY IT’S NUTS, especially for the little guys. So, so so easy. Soooo easy. And if it can be a craft sans glue, even better. But there should be a sample made so the kids (and parent!) know what they’re making, and the craft supplies should be in individual bags, so there’s no fumbling for pieces. And there should be a bag of ‘extra’ supplies in case one kid’s missing that one pink sparkly heart. I like craft stores for this kind of thing–you can buy easy crafts for under ten bucks, and most sets have enough for 18-20 crafts. 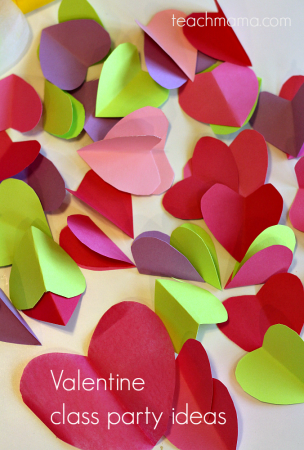 Consider something like the Mini-Stained Glass Hearts or something similar–no glue, pretty, and kids love them! Group 3: Valentine HEART Bingo — Good, calm-down bingo game with a Valentine’s Day theme. 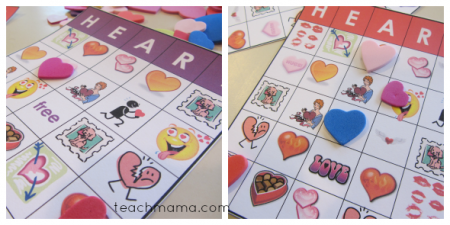 Valentine’s Day HEART Bingo can be downloaded and shared here (valentines day HEART bingo). The biggie thing here is to have bingo markers and to print out the bigger cards along with the game–the words are under the item, so there’s a wee bit o’ learning that can go along as the bingo caller can point to the larger card when the smaller cards are flipped: Okay, I flipped ‘H’ and the ‘fire heart’. Everyone look for the ‘fire heart’ under ‘H’–it looks like this. . . First one with five in a row, shout ‘HEART’!!! Group 4: Candy Hearts & Chopsticks — A bunch of chopsticks and a bunch of candy hearts means some serious fine-motor work for elementary schoolers! 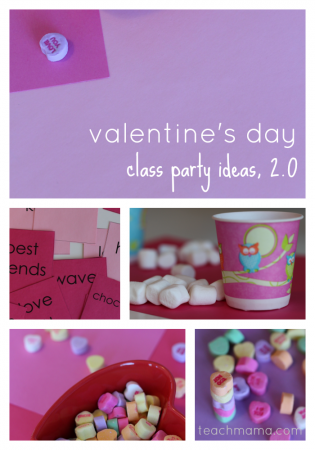 Pour a few handfuls of candy hearts into a centralized bowl, and give each child a small paper plate or small paper cup. Then let ’em at it! The winner will be the person who moves the most candy hearts from the bowl to his or her plate in the set time. 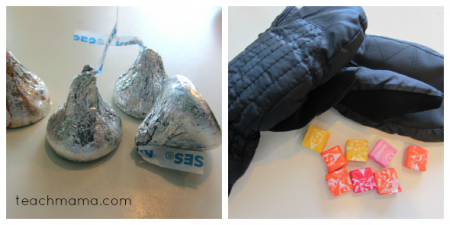 Give each kiddo a sandwich bag to save his or her winning candy! Free time at the end of the par-tay? Nothing like a good ole fashioned game of Freeze Dance! Make sure you bring your CD player and your kids’ favorite Kidz Bop CD, and you’re good. To. Go. Or adapt these cool activities for the dreaded extra 10 minutes of a party. Class parties have been held for years and years and years and years, so let’s start sharing our trade secrets, right? Anything else to add? Please leave me a comment with your ideas, both successful and not-so-successful. We’re all in this together, so let’s share what works! 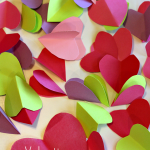 What are your favorite Valentine ideas for kids? I’d love to hear ’em! Wow! Thank you so much for the comprehensive party plan here. No doubt the kids at this party had a great time! I will use several of your ideas at my daughter’s fourth grade class party this year. FUN! you got it, Sarah! And if there’s something else to add, let me know–a game that rocks, some helpful hints, we’ll take it! Forget Pinterest – I’m just copying this. Although first I should probably find out if Beezus and Ramona are having Valentine’s Parties. Thank you thank you! totally copying this. But… what is freeze dance? ACK! My apologies! Freeze dance is simply throwing on the tunes, letting kids dance, and then making them freeze when you turn off the music! They’ll giggle, they’ll laugh, and they’ll fall down trying to freeze. Easy but fun! Love it:). At our school, the snacks are set- so at Christmas it’s decorating sugar cookies (the whole school, though each class does it individually) and at V Day it’s ice cream sundaes. Parents volunteer to bring in strawberries, bananas, blueberries, V Day sprinkles, and chocolate sauce, and the PTO buys gallons of huge vanilla ice cream. Each class plays a game, does a craft, and passes out cards:). We’re doing V Day bingo as well- very similar to yours, except without the HEART at the top. I love your plan- looks awesome! Wow! What a great idea–keep it all the same and make it easy–but still keep it special for the kiddos. LOVE it! Huge thanks for sharing, my friend, and even bigger thanks for taking the time to write!! As part of our 2nd grade party, we’re making cards, but rather than giving to classmates, they will be handed out with Meals on Wheels next day. (One good thing abt having the party on the 13th). Johanna! GREAT idea! I’m sure your kids will be making so many elderly and homebound people so very, very happy! Thanks for sharing!